To many, including some close photographer friends, Black-and-White is the very definition of photography. John Sexton is an iconic master of the Black-and-White photography art. John was born in 1953, and has lived on the Monterey Peninsula in California for more than thirty years. Respected as a photographer, master printmaker, author, and workshop instructor, he is best known for his luminous, quiet, black and white photographs of the natural environment. Recently, in addition to a series of tutorials on digital Black-and-White printing, Epson filmed and produced two in-depth interviews from two photographic icons, both working with traditional Black-and-White tools. The first of these icons is John Sexton. John’s insight provides inspiration to all as he discusses the Black-and-White print, be you a traditional large format film or a digital DSLR based photographer. his amazing body of work produced with traditional Black-and-White film, chemistry and paper. Many thanks to Epson for producing this excellent instructional material. For the last 40 or so years, John Sexton and his photographer friends have given a series of Black-and-White workshops held in locations around the world. These workshops ALWAYS full up, and usually shortly after their announcement. 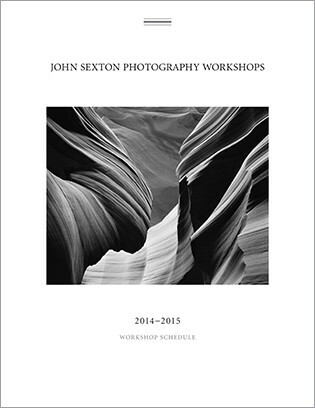 For the Black-and-White large format film photographer, John’s workshops are widely considered in the industry to be truly the “Masters Classes.” John has just released his workshop calendar for the 2014-2015 workshop season. I’ve linked to the PDF of the Complete workshop brochure for those who wish to. Download it here now.